In Medieval music, the Guidonian hand was a mnemonic device used to assist singers in learning to sight-sing. Some form of the device may have been used by Guido of Arezzo, a medieval music theorist who wrote a number of treatises, including one instructing singers in sightreading. 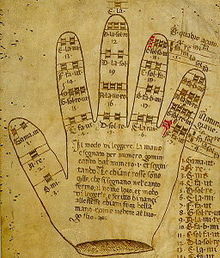 The hand occurs in some manuscripts before Guido's time as a tool to find the semitone; it does not have the depicted form until the 12th century. Sigebertus Gemblacensis in c. 1105–10 did describe Guido using the joints of the hand to aid in teaching his hexachord. The Guidonian hand is closely linked with Guido's new ideas about how to learn music, including the use of hexachords, and the first known Western use of solfege. The idea of the Guidonian hand is that each portion of the hand represents a specific note within the hexachord system, which spans nearly three octaves from "Γ ut" (that is, "Gamma ut") (the contraction of which is "Gamut", which can refer to the entire span) to "E la" (in other words, from the G at the bottom of the modern bass clef to the E at the top of the treble clef). In teaching, an instructor would indicate a series of notes by pointing to them on their hand, and the students would sing them. This is similar to the system of hand signals sometimes used in conjunction with solfege. There have been a number of variations in the position of the notes on the hand, and no one variation is definitive but, as in the example below the notes of the gamut were mentally superimposed onto the joints and tips of the fingers of the left hand. Thus "gamma ut" (two Gs below middle C) was the tip of the thumb, A ("A re") was the inside of the thumb knuckle, B ("B mi") was the joint at the base of the thumb, C ("C fa ut") was the joint at the base of the index finger, and so on, spiraling around the hand counterclockwise past middle C ("C sol fa ut") until the D a ninth above middle C ("D la sol") (the middle joint of the middle finger) and the E above that ("E la") (the back of that joint, the only note on the back of the hand) were reached. This device allowed people to visualize where the half steps of the gamut were, and to visualize the interlocking positions of the hexachords (the names of which—ut re mi fa sol la—were taken from the hymn Ut queant laxis). The Guidonian hand was reproduced in numerous medieval treatises. Guidonian hand. Colors indicate the three modes of hexachord: durum (hard, equivalent to G major), naturale (natural, equivalent to C major), and molle (soft, equivalent to F major). Exact notation to the hexachord system can be found in a reproduction of Ameri Practica artis musice (1271), or in the 1784 source Scriptores ecclesiastici de musica sacra potissimum. Reproduction of Ameri Practica artis musice (1271), ed. Cesarino Ruini, Corpus scriptorum de musica, vol. 25. Each hexachord could start on G, C or F and the adjacent table, reading upwards from the bottom, shows the notes in each hexachord for each of three octaves. Reading from left to right could, within certain limits, permit notes within different octaves to be distinguished from each other. Thus, C (modern c) was "C fa ut" (or "Cefaut"), c (modern c′) was "C sol fa ut", and cc (modern c″) was "C sol fa". Since the lowest pitch was designated by the Greek letter Γ (gamma, for 'g'), the pitch was known as "Gamma ut" or "Gamut", a term which came to designate the range of notes available, and later, a complete range of anything. The hexachordal system also distinguished between B♭ (fa in the F hexachord, and known as "B molle" for 'soft B') and B♮ (mi in the G hexachord, and known as "B durum" for 'hard B'). Over time, the soft and hard variants of 'b' were depicted as a rounded '♭' and a squared-off '♮' which gradually developed into the modern flat and natural signs (or, in Northern Europe, into the letters 'b' and 'h'). Since a single hexachord did not cover every possible note in the range of the gamut (only C–A, F–D excluding B♮, or G–E excluding B♭), singers would have to "mutate" between hexachords if the range of a sixth was exceeded or if there was an alternation between B♮ and B♭. In this way the "Guidonian" system of multiple hexachords was different from the modern system of solfege, wherein a single set of syllables suffices to name all possible pitches (including, often, chromatic pitches) within a mode. ^ McNaught, W. G. (1893). "The History and Uses of the Sol-fa Syllables". Proceedings of the Musical Association. 19: 35–51. ISSN 0958-8442. Retrieved 2010-02-26. ^ a b c Randel, Don Michael, ed. (2003). "Hexachord". The Harvard Dictionary of Music (4th ed.). Cambridge, MA: Harvard University Press. pp. 390–391. ISBN 978-0-674-01163-2. Retrieved 2010-02-26. Claude V. Palisca. "Guido of Arezzo", Grove Music Online, ed. L. Macy (accessed June 13, 2007), grovemusic.com (subscription access). Andrew Hughes. "Solmization", Grove Music Online, ed. L. Macy (accessed March 12, 2006), grovemusic.com (subscription access). Wikimedia Commons has media related to Guidonian hands.